The leadership of Nigeria is quite important to all of us – Ouattara – Royal Times of Nigeria. 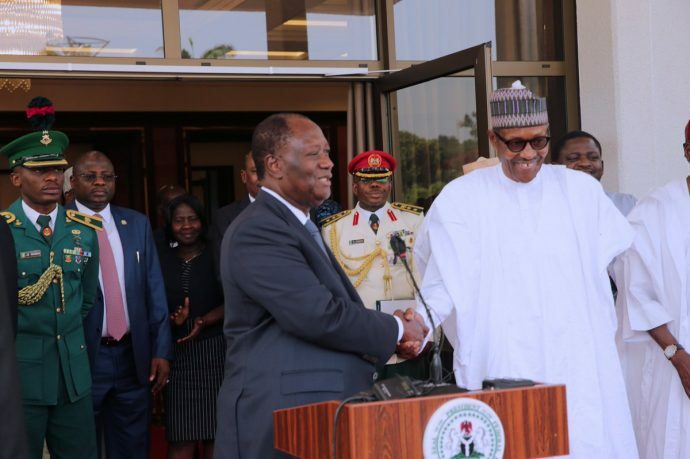 President Muhammadu Buhari On Monday met with Cote d’Ivoire President Alassane Ouattara at the Presidential Villa, Abuja. Ouattara speaking with reporters said: “It is a great honour and privilege to be in Abuja to see my brother and exchange views with him on the bilateral relations between Nigeria and Cote D’Ivore and to see how our sovereign nation is doing and also, of course, we had the opportunity to exchange views on major issues on the continent and the world. “I will like to thank President Buhari for his invitation. I had expressed the wish to come and see him, we had been in touch and I came to tell him that we are very happy that he is back in good health. This is important not only for Nigeria but for the whole of West Africa and our continent. We pray God that his health continues to be strengthened and be better for him to lead our sub-region. “President Buhari has shown a great leadership with the fight against Boko Haram, insecurity in the sub-region and also on economic matters. “I expressed to him the fact as an economist and having worked in Nigeria many years ago, I am impressed by the measures which have been implemented to lift Nigeria out of recession. “Nigeria has seen a sharp drop in the price of oil and Cote d’Ivoire has also experienced an important decrease in the price of cocoa. As you are all aware, Cote d’Ivoire produces 40 percent of world cocoa, two million tons and the price dropped early this year by 40 percent. “So this has had a negative effect on our economy. I know what Nigeria went through with the sharp drop in the price of oil. So I expressed to him my admiration for all the measures which have been taken to lift Nigeria out of recession and to wish all the Nigeria people well because our sub-region has made a lot of progress over the past few years and we need to strengthen the bilateral relationship between Cote d’Ivoire and Nigeria. This is what we discussed and we have committed ourselves to do so. “We also discussed the situation in Togo and situation in Liberia on those we have complete consensus on how we should go about to strengthen democracy in our sub-region,”. According to him, President Buhari had promised to attend the AU/European meeting in Abidjan at the end of November.